Heiligkreuz lies in a side valley of the Binntal. Its is an hamlet which is situated in a beautiful surroundings. Here you can take numerous nice walks. On the end of Binntal lies im Feld, here is a gemstone mine where you can cut out your own gems. For excursions you can go to Fiesch and Brig. A visit to the famous Aletschgletscher of course may not be missed. 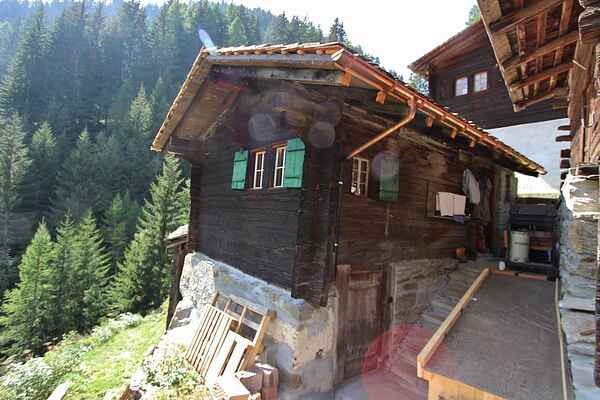 Chalet Saflischgarten is very peacefully situated in the hamlet Heiligkreuz. It is a perfect destination for the rest seekers and walking lovers who love special but simple holiday houses. You reach the chalet through a walking path of approx. 150 metres. The interior is simple but of a good standard. You have access to a terrace with a sitting section and a small garden. Straight from the chalet you can start many beautiful walks.